The first TinyMUD was the identically named TinyMUD, now generally known as TinyMUD Classic. It ran from August 19, 1989 to April 29, 1990. Lauren Burka's MUDdex has a copy of the messages that announced the beginning and the end of its run. There's also a Wikipedia entry about it. On August 20, 1990, Fuzzy(#27893) took down Islandia, the most prominent mud of the time, and put up Classic in its place, declaring the first Brigadoon Day. (Curiously enough, there was a Muck called Brigadoon that was popular in late 1990/early 1991.) Since then, on or around August 19-20, it's become popular to bring up old MUDs for the day (or week, or until the person running them gets tired and shuts them back down). In 1998, I took a copy of the now-publically-available copy of the TinyMUD database (James Aspnes, aka Wizard(#1), released it into the public domain) and brought it up under TeenyMUD 2.0, it being the best source that I could find at the time that would run Classic acceptably. Since then, when able, I've been bringing it back up every August. Brigadoon Day 29 is over, but mark your calendars for Tuesday, August 20, 2019 (and spread the word) for Brigadoon Day 30. If you're looking for some place to hang out until then, come visit Finrod's mush TwilightZone at muds.toccobrator.com 9901. If you'd like to arrange a tour of TinyMUD Classic, please contact him there (and possibly wait for him to deidle). If for some obscure reason you're actually interested in working on the ancient TinyMUD source, you can also contact him there. DruidMuck: druidmuck.egbt.org 4201 DruidMuck's host's net went flaky. If anyone has an update on it, please let me know. Sally "Kate" Roberts Galley was found dead on August 10, 2015 of an apparent suicide. She is mourned and will be missed by all of us. 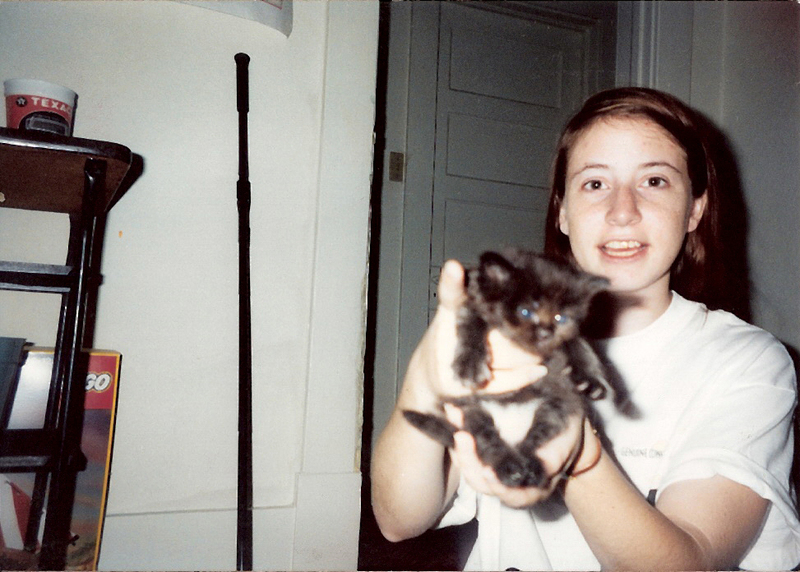 The picture above is from 1993, when she was showing me the kitten she was bringing. We named him Kazza. IMPORTANT NOTE: Everyone's password has reverted to 'password' like it did back in 2004. If you created a new character or did anything on or after 2004, it will be gone. But, I'm happy to say that the problems that kept Classic dark for the last three years should be in the past for good now. Classic is running on the same code it ran on back then, so compatibility is certainly not an issue any more. 18M database dumps and 28M process sizes just don't scare even obsolete hardware now. Gregory Joseph Blake, aka snooze(#100899), dinosaur mudder of long standing, passed away on June 5, 2006. He will be greatly missed by all of us. His blog is still up with additional information and memorials. TeenyMUD 2.0 has been punted in favor of t33ny: an updated Teeny 1.x courtesy of Andrew Molitor/bob(#12420). It's the closest thing to what Classic originally ran on that's disk-based. Noisy whispers are on; pages and whispers are also enabled. Since TeenyMUD 2.0 stored its passwords one-way encrypted, all character passwords have been reset to 'password'. However, all other changes made since 1998 have been preserved. If you were at Classic's DeathDay back in April, your password is whatever you changed it to then. Since mudding got started before the rise of Microsoft Windows, most clients are Unix-based. However, there are a number of clients out there for most any operating system. The most popular is TinyFugue; many other mud clients are listed on the Wikipedia page about MUD clients. You can connect directly to the port via telnet, but depending on your OS, you may experience various levels of disappointment with connecting that way. Windows in particular will exhibit the dread staircase effect, since Unix terminates lines with a LF only, while Windows expects CR+LF; but even without that problem, raw telnet will do no word-wrapping for you, and your input will commingle with your output in a likely undesirable way. It's doable in a pinch but you're probably best off with a MUD client. Classic is currently down, sorry.